September’s Book Club Bloggers’ selection, Maniac Magee, and I got off to a rough start. I was completely unfamiliar with the book. So, when I went to pick it up at the library I was a bit disappointed to discover that it was in the CHILDREN’S section. Not the young adult fiction section but the actual JUVENILE section. It was in with the chapter books and the "Choose your own Adventures." Now, I love a "Choose your own Adventure" as much as the next girl, but I was a bit worried about reading and blog discussing a juvenile book. Despite my snobbery hesitation, I decided to bring Maniac Magee home and give it a try. I’ve got to tell you, the book left me a bit confused. I can’t write a glowing review, because I didn’t LOVE it. But I can’t write a scathing review, because I didn’t HATE it. For me, the book was just kind of ho-hum. I didn’t connect passionately with any of the abundance of characters. 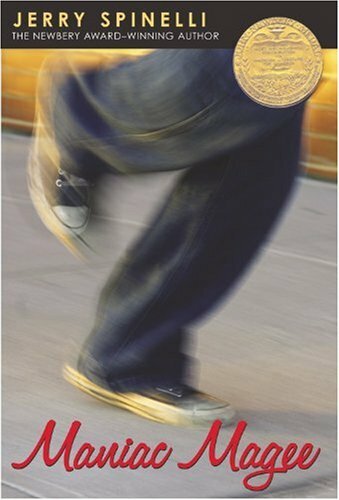 I wasn’t convicted by the author’s message or inspired to make changes in the world – which is a bit surprising given the weight of the issues Maniac Magee addresses. But what is most damning is that I never found myself dying to pick it up to see what happened next. It felt more like a reading assignment than reading for enjoyment. In short, Maniac Magee is the legend of a homeless boy who does all he can to integrate a community. Framing the plot of Maniac Magee as a legend removes it from space and time and allows Jerry Spinelli to comment on both race relations and homelessness from a detached point of view. Two Mills (the town in which a majority of the story takes place) could be anywhere and the title character could have lived at any time. Having lived in two very segregated cities (both St. Louis and Chattanooga have color lines that remain drawn) I would argue that it’s a story that could be set in the present. But I will admit that as I read it, I pictured a world that looked more like an America depicted in movies and sitcoms of the 70s than today. Writing Maniac Magee as a legend was a clever move on Spinelli’s part, in my opinion. A lack of grounded time and place allow the reader to focus more on his message and less on the specificities of a particular place or time. The tender relationship Maniac shared with Grayson is what saved the book for me. The warmth of their interaction and their sweet dependence upon one another was an unexpected bright spot. As for the rest of Spinelli’s book, I found it walking a line just like Maniac did at the end of Part 1. Except, instead of being taunted and beckoned by a black community on one side of the street and a white community on the other, Spinelli managed to JUST escape preachy soap boxing calling him to one side and predictable, uninspiring story telling on the other. Thankfully, just like his character, Spinelli made it out of town without fully falling victim to either bully and produced what was for me, a mildly entertaining story with a few bright spots of interpersonal connection that made the remainder tolerable. Now, I can't wait to read what everyone else thought about it. You can too. Just hop on over to The Daily Snapshot and take a look at all the other Bookclub Bloggers' posts! Not sure what I'm talking about??? ?Click this button for more information on the book club.